Does the shop treat you fairly and honestly? Do they give you good information and enough information to help you make good decisions? Do they care about you as a person? Diagnosing and repairing vehicles is a complex and demanding field. Mechanics make many decisions that affect the quality, dependability, and longevity of their repairs. Would you rather pay more for a long-lasting repair or less for one that may fail you prematurely? 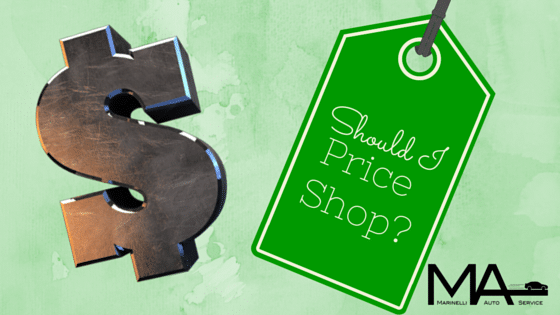 What happens when people price-shop? These shops may cater to the desire not to spend money, but that doesn’t mean you’ll actually spend less in the long run! Value is what really saves you money over the long haul. Value is presented by quality service, services, and products at a fair price. Now am I suggesting that you forget cost? Not at all! Spending wisely requires balancing cost versus value. I don’t recommend cost shopping, but I do recommend seeking out a trustworthy auto repair shop where you can build relationships with the employees. Don’t go looking for the lowest cost. Look for trustworthy people who care about you, and the cost will take care of itself.